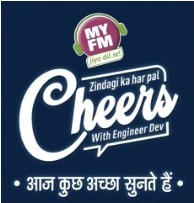 MUMBAI: India’s leading FM station MY FM has launched its show ‘Cheers’ on 18th March. ‘Cheers’ is a well segmented show with fine music, conversations and an on-air friend, which is aired from Monday to Friday at 9 pm. The ‘Cheers’ show featuring non-cliché on air friend ‘Dev’ will treat the listeners with helping people deal with challenges, insecurities & complex human relations & situations thrown by life. Be it relationship conflicts, professional issues or personal problems, ‘Dev’ will give a unique perspective on it all. The double dose of entertainment will reflect in the way he speaks to the callers, shares anecdotes or the brief interactions with his secretary and secret admirer Rina.